917 people want to go here. 752 people have been here. Germany is the largest country in Central Europe. It is bordered to the north by Denmark, to the east by Poland and the Czech Republic, to the south by Austria and Switzerland, and to the west by France, Luxembourg, Belgium and the Netherlands. Germany is a federation of 16 states, roughly corresponding to regions with their own distinct and unique cultures. Germany is one of the most influential nations in European culture, and one of the world's main economic powers. Known around the world for its precision engineering and high-tech products, it is equally admired by visitors for its old-world charm and "Gemütlichkeit" (coziness) or hospitality. If you have perceptions of Germany as simply homogeneous, it will surprise you with its many historical regions and much local diversity for its relatively small size. The Black Forest is a wooded mountain range in Baden-Württemberg, southwestern Germany. It is bordered by the Rhine valley to the west and south. The highest peak is the Feldberg with an elevation of 1,493 meters (4,898 ft). The region is almost rectangular with a length of 200 km (120 mi) and breadth of 60 km (37 mi). Hence it has an area of approximately 12,000 km (4,600 sq mi). The name Schwarzwald, i.e. Neuschwanstein Castle is a 19th-century Romanesque Revival palace on a rugged hill above the village of Hohenschwangau near Füssen in southwest Bavaria, Germany. The palace was commissioned by Ludwig II of Bavaria as a retreat and as a homage to Richard Wagner. The palace was intended as a personal refuge for the reclusive king, but it was opened to the paying public immediately after his death in 1886. Since then over 60 million people have visited Neuschwanstein Castle. The Hohenzollern Bridge is a bridge crossing the river Rhine in the German city of Cologne (German Köln). It crosses the Rhine at kilometre 688.5. Originally, the bridge was both a railway and street bridge, however, after its destruction in 1945 and its subsequent reconstruction, it was only accessible to rail and pedestrian traffic. It is the most heavily used railway bridge in Germany, connecting the Köln Hauptbahnhof and Köln Messe/Deutz stations with each other. 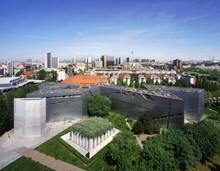 The Jewish Museum Berlin (Jüdisches Museum Berlin), in Berlin, Germany, covers two millennia of German Jewish history. It consists of two buildings. One is the old Kollegienhaus, a former courthouse, built in the 18th century. The other, a new addition specifically built for the museum, designed by world-renowned architect Daniel Libeskind. This was one of the first buildings in Berlin designed after German reunification. The museum opened to the public in 2001. Princeton professor W.
The Berlin Stasi Museum, known locally as the “Research and Memorial Site Normannenstrasse”, tells the story of the infamous secret police of East Germany, an important tool of the dictatorship. 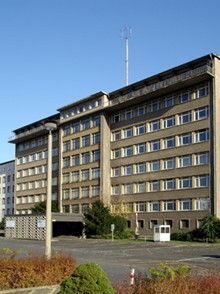 Opened in 1990, the museum is set within the offices of Erich Mielke, the head of Stasi from 1957 to 1989. The office was home to 8,000 employees and some rooms have been preserved in the same condition as they were during the Stasi occupation of the building, giving visitors a good understanding of what life was like for those working there." 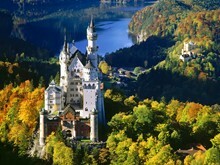 Neuschwanstein Castle was built upon the wishes of Ludwig II of Bavaria. It was meant to be a retreat for the king. It was also designed to pay homage to the works of Richard Wagner. 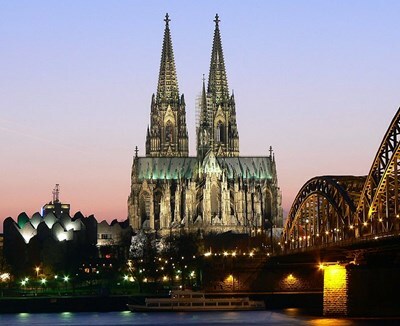 The 406 metre Hohenzollern Bridge in Cologne; a structure that has been slowly covered in padlocks since the romantic trend reached the city in 2008, much to the annoyance of local government."